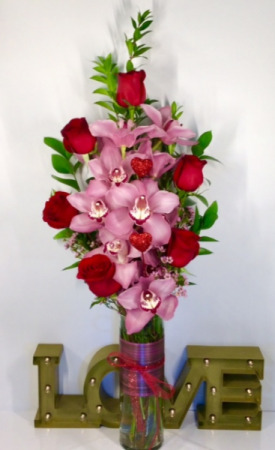 Impress that special someone with this classy and unique 10” glass cylinder filled with a large cymbidium orchid and premium red long stemmed roses. It has fragrant wax flower for filler and sparkly heart picks. Really show your love and admiration with this romantic arrangement in a red glass vase filled with 3 premium red roses and babies breath. It is adorned with a glittery bow and a "Happy Valentine's Day" pick. It also comes with a 7 oz. bag of Russell Stover solid milk chocolate hearts. Red roses mean love! 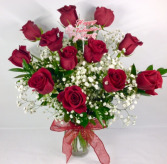 This is our classic medium stem premium red rose arrangement with babies breath. 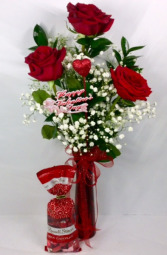 They are arranged in a clear glass vase and accented with a sparkly bow and a "Happy Valentine's Day" pick.